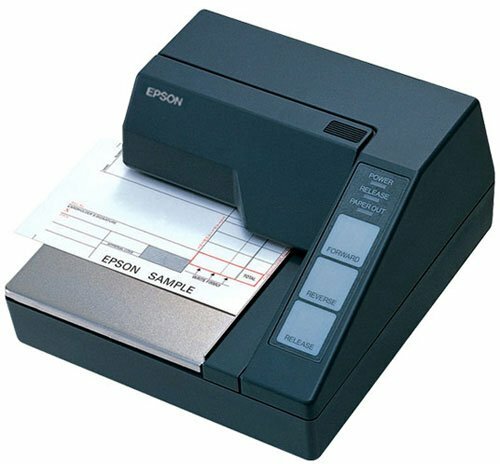 Epson TM-U295 - Impact slip printer, 2.1 lps, serial interface. Order serial cable (Part# 03019) and power supply/AC adapter (Part# C825343) separately. See accessories. Color: Dark gray. The world's smallest slip printer, perfect for POS terminals. We use the machine to validate checks that are received for Hearings. Clear and legible. None this far! We use the tm-u295 to print scale receipt tickets. Our only issue has been how to set up font size and ticket layout. Not much info on driver availability and what functions can be customized. Just started playing with it and hopefully will get it all figured out. Purple Ribbon for TM-U295, Single Ribbon. Black Ribbon for TM-U295, Single Ribbon. Black Ribbon for TM-U295, Case of 10 ribbons. The Epson C31C163292 is also known as Epson POS Products	EPS-C31C163292	.